E-Prime 2.0 SP1 (2.0.10.353) introduced an easier way to configure the SNTP clock in E-Prime. 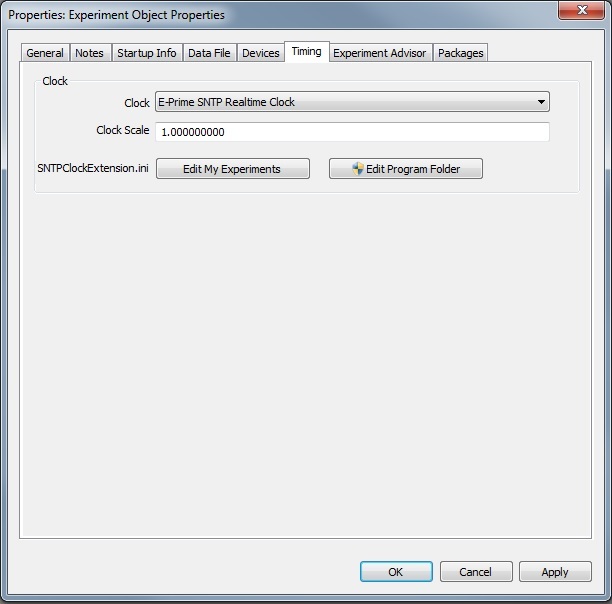 When the E-Prime SNTP Realtime Clock is selected in the Experiment Object Properties pages, you can gain access and edit properties of the SNTPClockExtension.ini file from the Graphical User Interface (GUI). Previously, users had to launch a text editor outside of E-Studio to create or edit the SNTPClockExtension.ini file. E-Prime provides the ability to choose from available clocks via the E-Studio GUI. One of the available clocks is the SNTP Realtime Clock. In order to allow E-Prime to use the SNTP Realtime Clock, the following configuration property settings must be specified in an .ini file. IP IPv4 address of NTP server (default: 0.0.0.0). Port Port to connect to NTP server (default: 123). 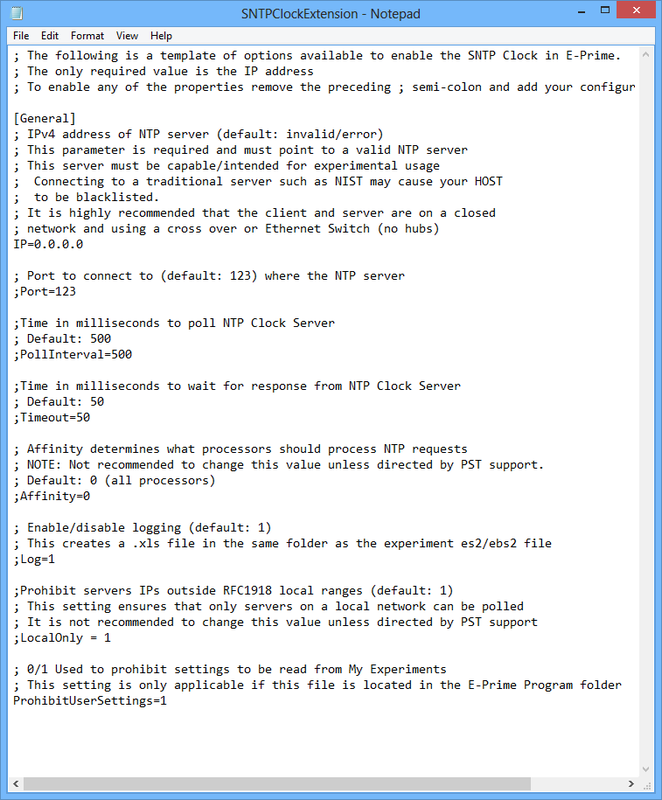 PollInterval Time in milliseconds to poll NTP Clock Server (default: 500). Timeout Time in milliseconds to wait for response from NTP Clock Server (default: 50). Affinity Determines what processors should process NTP requests (default: 0). Not recommended to change this value unless directed by PST support. Log Creates a .xls file in the same folder as the experiment es/ebs file (default: 1). LocalOnly Prohibit servers IPs outside RFC1918 local ranges (default: 1). Not recommended to change this value unless directed by PST support. ProhibitUserSetting Prohibit settings to be read from My Experiments (default: 0). This setting is only applicable if this file is located in the E-Prime Program folder. NOTE: Before E-Prime 2.0 (2.0.10.353), the SNTPClockExtension.ini file had to be manually created and placed in one of the locations discussed below. To expedite the editing process for the SNTPClockExtension.ini file, a feature exists that allows you to access the contents of this file directly from E-Studio's GUI. This can be found by opening any instance of E-Studio and double-clicking on the Experiment Object. Once the Experiment Object is opened, you can navigate to the Timing tab and set the Clock property to "E-Prime SNTP Realtime Clock". The template version is an annotated version of the SNTPClockExtension.ini file that explains the purpose of each value and provides a placeholder for each value. Once the proper values have been entered and the SNTPClockExtension.ini file has been saved, E-Prime is able to use the SNTP Realtime Clock.